There is a belief, shared by many, that the Sport of Kings is actually the Sport of Whales. And by “whales” I’m not talking about the creatures that gave Captain Ahab and Pinocchio such fits. I’m talking about big bettors — the guys that move the lines, the so-called “smart money” players. According to some, the presence of whales in the betting pools is like having a potluck with the offensive line of a football team — good eating for the linemen and slim pickings for everybody else (who’s going to tell a 300-pound guy to lay off the peach cobbler?). But is this really true? Does the presence of smart money in the pools really make it impossible for the average bettor to turn a decent profit? Of course, this high-volume, low-return approach is well known in the business world. Costco (Nasdaq:COST), which operates approximately 762 discount warehouses around the world, has maintained a 2.21 percent profit margin over the past 12 months. Conversely, Macy’s Inc. (NYSE:M), and upscale retailer with locations in the US, Guam and Puerto Rico, operated with a 6.66 percent profit margin over the same time period — considerably higher than that of Costco. Yet guess which company has the highest (diluted) earnings per share over the past year? If you guessed Costco, give yourself a pat on the back. The wholesale giant earned $7.09 per share ($18.42 billion in gross earnings) versus $5.38 per share ($9.69 billion in gross earnings) for Macy’s. But just because Costco was able to produce greater profits than Macy’s, does that mean that Macy’s should throw in the towel and shut its doors? Of course not. Granted, retail is not a zero-sum game like horseracing is, but the point remains: just because a particular person or business is less successful than another does not make them/it a failure. Not convinced? Let’s look at it mathematically. Let us assume that Willie the Whale is operating at Parx Racing. I know what you’re thinking: Why in the world would Willie be betting on races from Parx, which has a fraction of the handle of tracks like Aqueduct, Churchill Downs or Santa Anita Park? Why indeed? It seems to me that if one is concerned about whales, the solution is simple — wager at tracks with smaller handles. 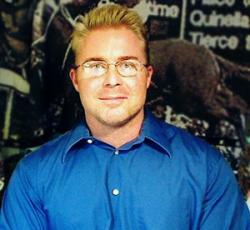 After all, when was the last time you heard of a professional bettor roaming the grandstands of Retama Park? 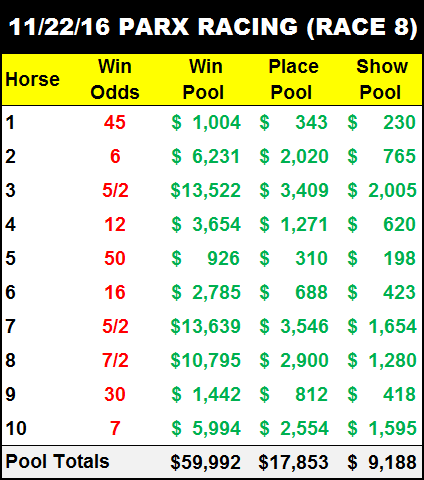 That being the case, in a race like the one shown here (the eighth event at Parx on Tuesday), Willie would control 14.3 percent of the win pool ($10,000 / $69,992). Now, the track takeout on win bets at Parx is 17 percent; hence, if Willie maintains a five percent ROI when betting to win, this means that other bettors are bucking what amounts to a 32 percent bite (assuming my math is correct). Obviously, 32 percent is nothing to sneeze at, but keep in mind that this is predicated on Willie controlling nearly 1/6 of the win pool. In real life, placing such a large wager at a track like Parx would be foolhardy, as Willie would make the longest shot on the board, 5-Wellington Wizard, the third favorite (from odds of 50-1 to 4-1) if he bet his entire $10K on him. If, say, Willie owned a more reasonable five percent of the win pool, other players would be tackling a 22 percent effective take — considerably less than what Parx charges on trifectas and superfectas (30 percent). Here’s something else for those fearful of whales to consider: Many of the big-money bettors employ similar handicapping techniques (regression analysis being a popular choice). Thus, in a sense, the real competition is amongst the whales, not John Q. Public. Plus, there is more than one way to reach a common goal. I disagree with other horseplayers (many of whom I respect as handicappers) all the time. Sometimes I’m right and they’re wrong; sometimes I’m wrong and they’re right. Nobody, except those who sell pro sports “locks of the week,” is right all the time. Making money at the racetrack is not confined to those with the biggest and best computers or the cleverest algorithms. Nearly anybody can make money if they put the time in to acquire the needed skills and dedicate themselves to wagering in a thoughtful and disciplined manner. As for the massive rebates that whales get… who cares? I understand that in today’s society one is expected to be incensed by any real or perceived injustice they face, but, seriously, how does it affect me if my buddy Willie the Whale is getting money back in the form of rebates? So, the next time you hear someone saying that the game of horseracing can’t be beat or that “insiders” and “whales” rule the day, pretend it’s one of the ladies on “The View” talking and ignore them.